It’s no coincidence that my Cabot Options Trader service not only doubled our readers’ money 10 times last year, but has also delivered a 71% win ratio. After all, since we launched Cabot Options Trader in 2010, we’ve handed our readers more than 157 winning trades—doubling their money multiple times! We’re going to blow our 2019 trades out of the water! Once you see how our Options trading system works, I know you’ll agree. My 30-day trial makes it easy and affordable to find out. My name is Jacob Mintz, and while this has been a rocky time for most investors, my members have been smiling all the way to the bank. “I doubled my money in 20 days! Thank you!! Keep up the good work!”—JoAnn L, Youngstown, Ohio. I’ve got all sorts of people making money with me at Cabot Options Trader—from seasoned pros … to main street investors looking to boost their performance … to newbies who have never traded options before. They all love my service because I make trading options as easy as trading stocks—but only for faster and bigger profits. My winning track record proves just that. If at the end of my email you agree, I’d like to extend to you my personal invitation to profit from Cabot Options Trader for the next 30 days without your risking a dime. Should you accept my invitation, you’ll not only understand the kind of life-changing profits Cabot Options Trader brings you but also why it’s important you accept my 30-day trial before we close the doors to new members. As you are about to discover, our Options Trading System does for options trading what Carlton Lutts’ momentum-based Optimo stock picking system did for growth investing when he created it back in 1970—not only doubling our readers’ money 29 times since then but also making many of our readers rich! It tracks the market’s more than 5,000 stocks, looking for those rare and exceptional situations where we can lock in money-doubling gains nearly every 90 days. This is how we’ve not only doubled our readers’ money ten times since we launched Cabot Options Trader in 2010 but also delivered more than 157 double- and triple-digit winners along the way. … but simply by trading fewer positions for bigger profits using put and call options to leverage our investments and lower our risks at the same time. I’ve made it so easy, affordable and risk-free for you to grab triple-digit gains every 90 days in our timely trades, you’ll never trade options any other way again. To create for our readers a simple, low-cost and effective way to increase your investment profits using the same kind of big-money trades that hedge funds and institutions make. As a result, we have been able to give the independent investor not only a low-risk/high-profit trading system that’s 100% unique to the market but also money-doubling profits tactical hedge fund traders enjoy across all sectors and in both rising and declining markets. With nine years under our belt now, the results have been simply phenomenal—doubling our readers’ money ten times while delivering 157 double- and triple-digit winners. That’s the beauty of our options trading system. It scientifically sifts and sorts through more than 5,000 possibilities and then narrows that list to the top 1% and then goes one step further, using our predictive algorithm to pick the single best trade from the bunch. As a result, we’ve been able to hand our readers 50% gains in our top trades, on average, every 90 days. Just like Cabot Growth Investor, Cabot Top Ten Trader, Cabot Small-Cap Confidential and our other wealth-building advisories, we do it all for you without your having to do any kind of chart reading or calculations. Our turnkey trading instructions will tell you what to buy, what to pay and which new trades to roll your profits into. Without having to have a billion-dollar bankroll either. That’s because stock options give you leverage at an incredible discount. So instead of buying 100 shares of a $50 stock, you can control hundreds of shares of the same stock for $5. That’s why a 10% move in the underlying stock can hand you 10 times the profits—or more—and on both the up and the down sides. This is how we not only banked a 307% gain in our Nutanix (NTNX) Calls when the stock rose 40% but also banked a 259% gain in Union Pacific Corp. (UNP) Calls when the stock rose only 19%. The same can be said for ALL our options trades—leveraging small moves in the underlying stocks for huge gains—all in an average of 16 days on both the UP and the DOWN sides. All without YOUR having to bet the farm, sit glued to your computer for hours, or have to wait years to collect your money. Don’t hesitate. Start here today. Simply put, it takes the guesswork out of options trading. Our system does that for you automatically using our proprietary options trading engine that identifies the block trades with the biggest potential along with the timing to maximize your profits. You can achieve hedge fund-like profits using simple options trades with zero guesswork on your part. You can make all our trades with three clicks of your mouse, just as you do when you buy and sell stocks the Cabot way: one to buy, one to sell and one to roll your profits into a new trade. For these reasons, if you can put the moneymaking power of our Options Trading System to work for you, you’ll be able to leverage small stock moves into huge profits too. You’ll buy low-priced options right at the tipping point of a breakout and sell for big gains too. And if you can roll those profits into our next trades, you’ll leverage yourself to even greater wealth—even if you’ve never traded options before. Of course, you needn’t take my word. Accepting this invitation today makes it easy, affordable and risk-free for you to do just that. 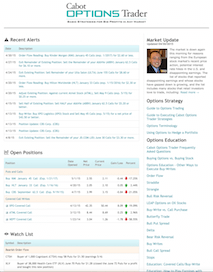 of Cabot Options Trader Risk-Free! That way you’ll be able to track our trades and see for yourself how you, too, can add the wealth-building power of options to your personal investing arsenal. You’ll get my complete buy instructions and target profit for each one of our options trades, along with our supporting data for each trade. You’ll also get my economic overview for the week ahead, along with the sectors we’re targeting for our next breakout. All for the next 30 days without risking a dime. I can make you this offer because once you get a taste for the explosive profits our trades will bring you, I couldn’t pry your subscription from your hands if I tried. With the 157 double- and triple-digit winners under our belt in the past nine years, I’m betting you’ll be with us for the next three years. If I’m wrong, you get a prompt refund on your subscription. No questions asked. Either way, you get 30 days to test-drive Cabot Options Trader without risking a dime. FREE: Three to four EZ Options Trades every six weeks, on average, along with confirming data directly from our computer-based system. FREE: Complete buy, sell and profit instructions on each one of our trades, along with our complete rationale for buying them. FREE: Weekly economic overview to keep you on top of the markets and trades. FREE: Flash buy and sell alerts via email and text to get you in and out of our trades at the maximum profit point. FREE: 24/7 access to our private Cabot Options Trader Web site, which includes a searchable archive of past trades along with numerous special trading reports designed to make you a better trader and investor. FREE Lifetime subscription Wall Street’s Best Daily, our email newsletter. FREE Welcome kit to Cabot Options Trader, consisting of a FREE Guide to Executing Cabot Options Trader Strategies. PLUS Cabot’s 100% money-back guarantee. Try out our revolutionary EZ Options Trading System that identifies the winning trades that could hand you 50% to 100% gains in days ahead. In an industry where hundreds of investing advisories come and go yearly, I’m proud to say the Cabot organization has withstood the test of time, helping investors like you take advantage of the greatest profit opportunities in the market for more than 48 years. The secret to our success is simple: We continue to offer our readers the most profitable and practical investment advice on the planet and at the most affordable price. Advice based on solid scientific technical and fundamental data and proven results and not on the whims of prognosticators who have proven to be wrong more often than not. If our trades don’t deliver the kind of quick profits I’ve spelled out here, cancel and you’ll get a FULL REFUND during your 30-day trial. So there’s no way you can lose. When my dad launched Cabot Growth Investor over 48 years ago, he did so with the goal of making stock investing accessible, profitable and affordable to the average investor. It is in that spirit that we launched Cabot Options Trader nine years ago at the low price of just $147 per month. If you join now, I will extend to you the same low introductory price. That comes to just under $5 a day and is a steal of a deal considering our long-term track record and the $500,000 in performance improvement to our services. You get to test-drive our new and improved Cabot Options Trader at our lowest price. We get to introduce you to our options trading service to show you how you, too, can make big profits with small stock moves by trading options the smart, safe Cabot way. As the publisher of Cabot Options Trader, I wish we could offer memberships to everyone who wanted to join. But I can’t. Just as we limited our Charter Memberships to no more than 1% of our Cabot readership, we must limit this one-day sales offer to the first 27 who say “Yes” today, because we have only 27 discounted trial memberships open. Once those spots are filled, my friend, this service will be closed until the next opening. And I can’t promise that will be anytime soon. With our Cabot “profit first” money-back guarantee, there’s no way you can lose either, unless you lose out on securing one of the 27 memberships available. So if you’d like to enjoy hedge fund profit without taking big risks with your money, now IS the time to join us. Try out our revolutionary EZ Options Trading System that identifies the winning trades that could hand you 50% to 100% gain in days ahead. I guarantee you’ll never see a better deal or join at a better time, as interest rates remain low, the global economy remains troubled, and volatility remains high. Join us now and experience the quick profits my Cabot Options Trader service can bring you.